Philips carefully unpacks the concept of transmedia in an accessible way, and warns us that it is more than a marketing technique. It is true that some of the most visible transmedia campaigns were marketing campaigns, but it’s no wonder that you have heard of these projects. The large studios behind them “have money to throw around”, Philips reminds us, and there are an immense amount of interesting indie transmedia projects too, from Pandemic to World without Oil. Transmedia is not a ploy, but is intimately related to stories and brands. Ideally, it extends those stories, franchises and brands in a natural way. Philips reminds us that it “sells education, play, entertainmrnt consumer, goods”. Some of the best transmedia experiences are educational games, such as World without Oil. There is not one purpose to this technique. The process is also about giving power to the audience – a frightening but satisfying experience when it succeeds. Through examples such as A.I., The Dark Knight, A.I., Halo, shows us the powerful ways in which audiences can participate in ARGs, as exemplary transmedia stories. Again, this is nothing new and there have been comprehensive academic books about this, but Philips breaks it down in a useful way. What topics are discussed in the guide? Strategies: What types of transmedia are there? What is most suitable for your case or brand? Audiences: How do you interact with audiences? Do you communicate directly? What game design techniques can you apply? Do you allow them to change the story world or contribute with their own content? How do you “manage” audiences? Creative: What is the future of transmedia? What haven’t we done enough? Team work: How do you write a story bible? What do you include? Financing: How do you monetize your campaign? 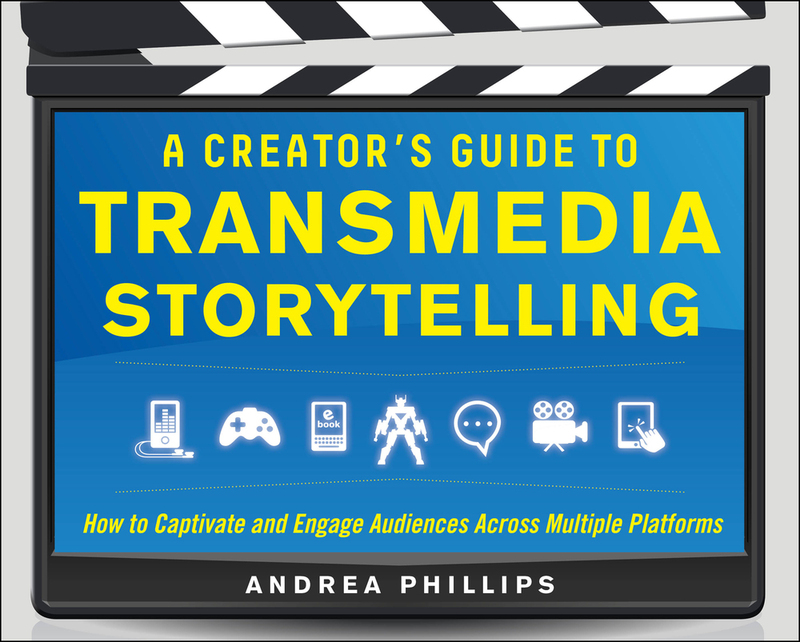 Small elements can have a big pay-off in transmedia stories. During the transmedia campaign of The Dark Knight, audiences could see the theft of a yellow bus which is also crucial in the movie. Make sure that you built such themes into the story early on, even if you have no idea where you will go. Leave room and ambiguity; small plot holes that you can work with. Draw inspiration from everything. Fiction has a long history. Theater, oral storytelling, movies and game design have many historically grounded techniques to engage audiences. Keep an eye on what’s new too, including emerging art forms, such as twitter fiction or e-poetry. Don’t get to hung up on definitions. Enough academic and professional debates have focused on the definition of transmedia. This is a broad category and it’s very difficult to say what is or isn’t transmedia. There is not one formula or one true and only type of transmedia. Interactive fiction, ARGs, websites, blogs, sound scapes – they can all be examples of this experience. It may involve “story archeology”, as Philips called it, or the dissemination of small clues and story bits across media, which audiences need to unravel and act upon. Audience behavior is tricky. You can try to predict it but you’ll often fail. One way out is to put a sock puppet in the audience. Someone who is seemingly the player but actually in touch with your team. This “sockpuppeting” technique fascinated me. The guide is interlaced with interviews with highflying media professionals in the field of transmedia. It makes for accessible reading and easy teaching material. The different examples are vivid and Philips gives clear-cut tips on how to create transmedia campaigns. While there is no clear formula, like she constantly emphasizes, there are clear do’s and don’ts. Transmedia is complicated. Where do you start? What will the role division be? The guide is an absolute must for anyone who wants to undertake a transmedia campaign. It is filled with tips on story bibles, flow charts for audiences, tips on blogging and roles in your team that you never considered (from bloggers to continuity managers). Though the book is concrete, I sometimes wished that it was even more hands-on. While there are examples, seeing reflection on a project from start to finish would have been interesting. Story bibles and fictional blogs are explained, but the separate boxes could have been used to illustrate this in a clear-cut way. When I read the book, I really kept it in mind for my courses. I was looking for a practical manual for my students. Something that shows them how transmedia is done as a creative technique and marketing tool. I usually teach this Dutch book Crossmedia Concepting but for international student groups, that is a no-go. This guide was exactly what I needed, and it might be what you need too. Whether you are a media professional, critic or teacher, I am sure that Philips’s clear-cut guide will inspire you! Previous First Edition of Dutch Comic Con is a Success!